Players will have the opportunity to run through some of the drills they will be evaluated on. This session is optional and is a drop-in, come and go event. Please enter through the back door of the facility as the front entrance is still under construction. Braves volunteers will be at the back door entrance to collect baseball fees/jersey deposit cheques and direct players to the appropriate area. This session is a joint session with the Saskatoon Blue Jays. We have been having some issues with our registration software RAMP. 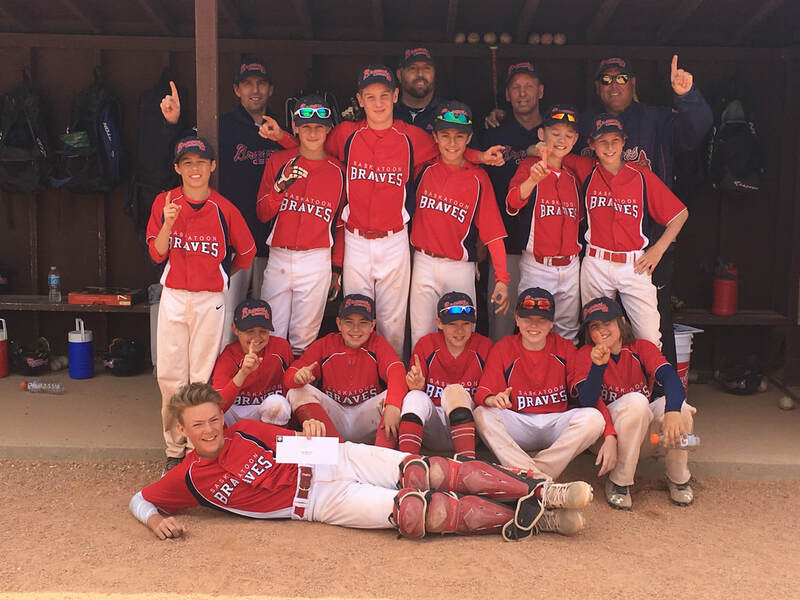 If you have not received a confirmation email from Saskatoon Braves for your child’s registration, please contact Cherolyn at registrar@saskatoonbraves.com to confirm. The zone will email more specific evaluation times to all players registered once times are solidified. There will not be evaluations for Midget. 1/15/2019 - Registration, Save the Date! The Brave Battalion won the AAA City Championship! 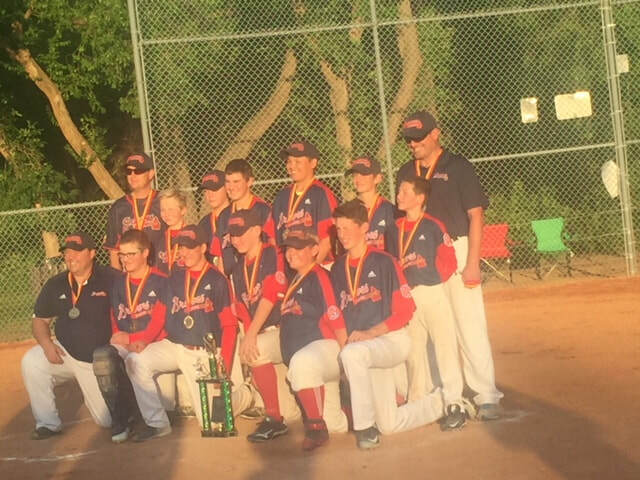 The AA Braves won the AA Provincials in Weyburn this past weekend! 7/31/2018 - AAA Pee Wee City Champs! Add one more to the trophy cabinet. 7/17/2018 - Bantam Boys City Champs! Another city championship for the Braves! 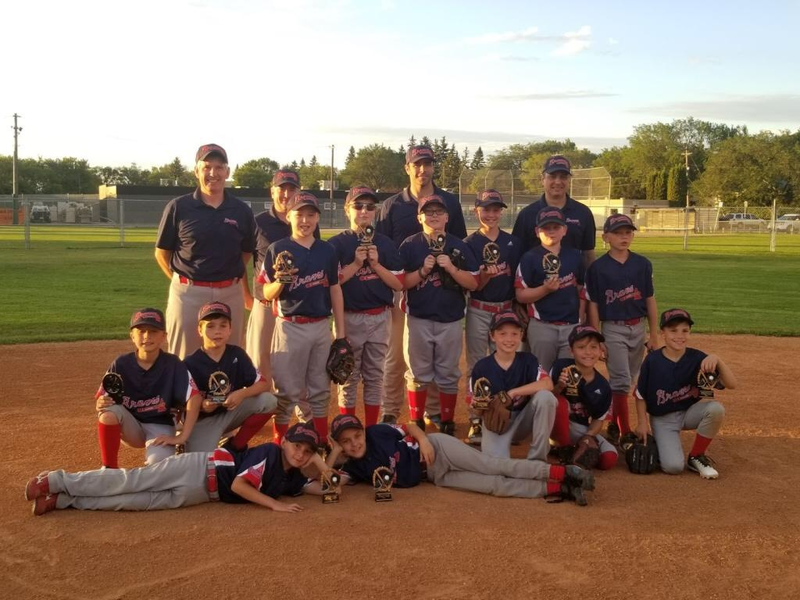 7/17/2018 - AAA PeeWee win a pair of tournaments! 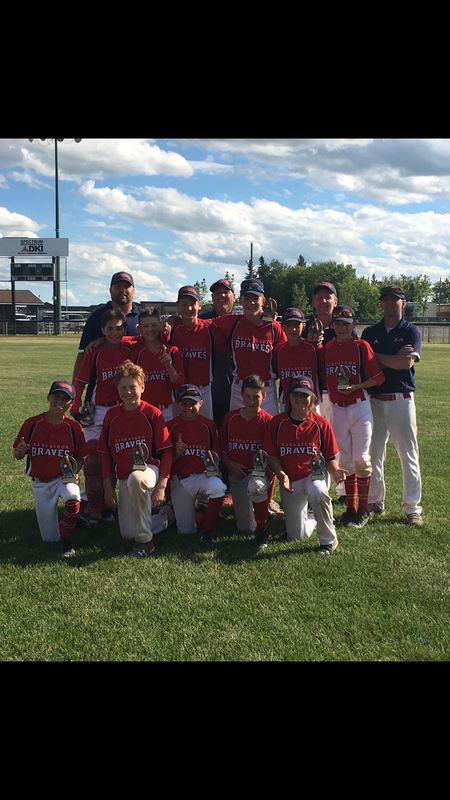 The PeeWee AAA Braves won the Lloydminster tournament and the Swift Current tournament. 7/10/2018 - AA Braves City Champions As Well! 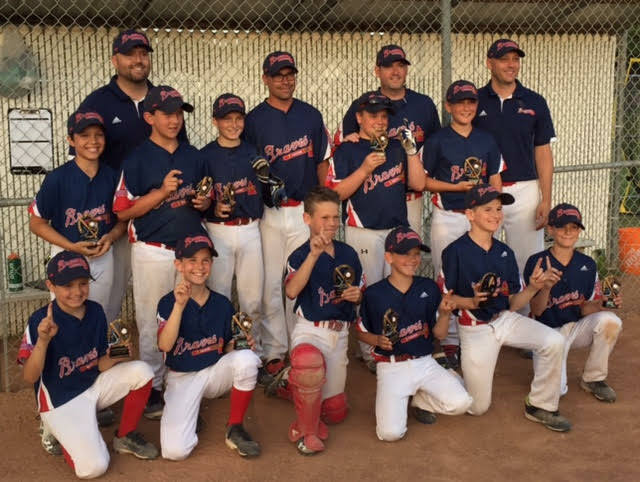 Our AA Braves team took home the city championship this week! 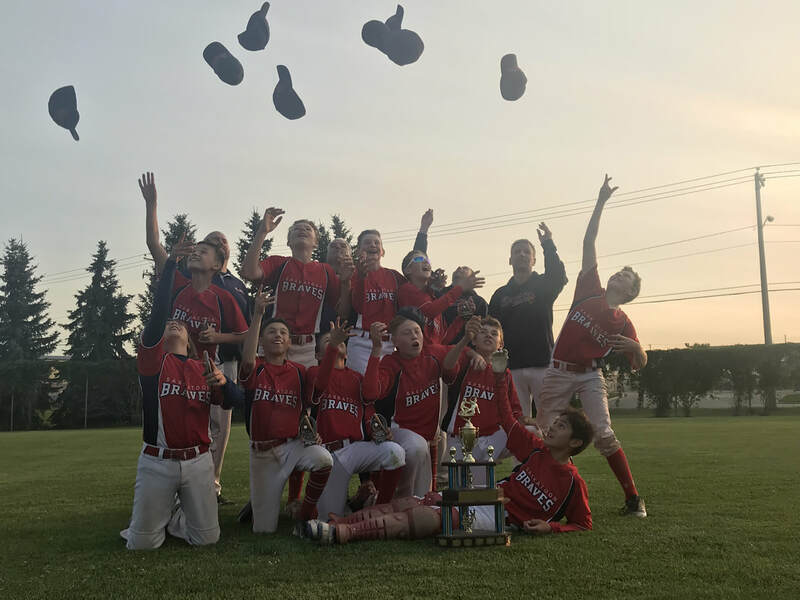 7/2/2018 - JR Braves are A City Champs! 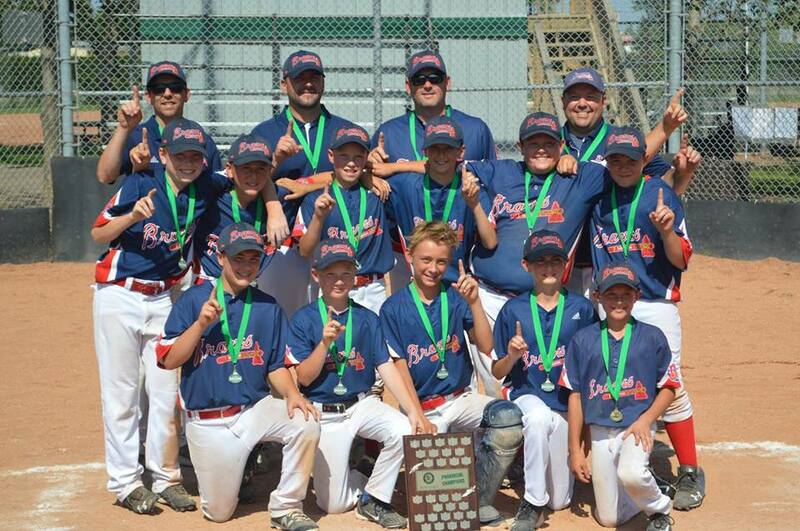 Congratulations to our JR Braves team on winning the city finals on Friday! 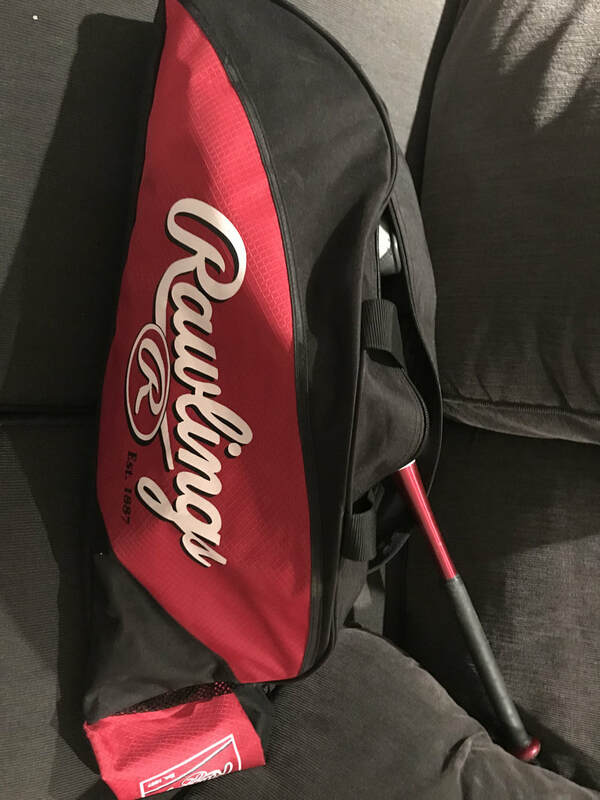 The Braves raffle was held this week. Below are the results. Congrats to all the winners! This year we will be running this the same as last year. We will not be holding the actual Bantam Selects Showcase Tournament as we have in the past. We will now be holding a Bantam Selects ID Weekend from June 9-10 in Regina at Columbus Park. Registration will start at 8:00 AM on Saturday, June 9 and the ID Camp will begin at 9:00 AM Sharp! The 15U Head Coach will be Mike Lindsay with his Assistant Coaches Brett Walchuk and Chris Sastaunik. 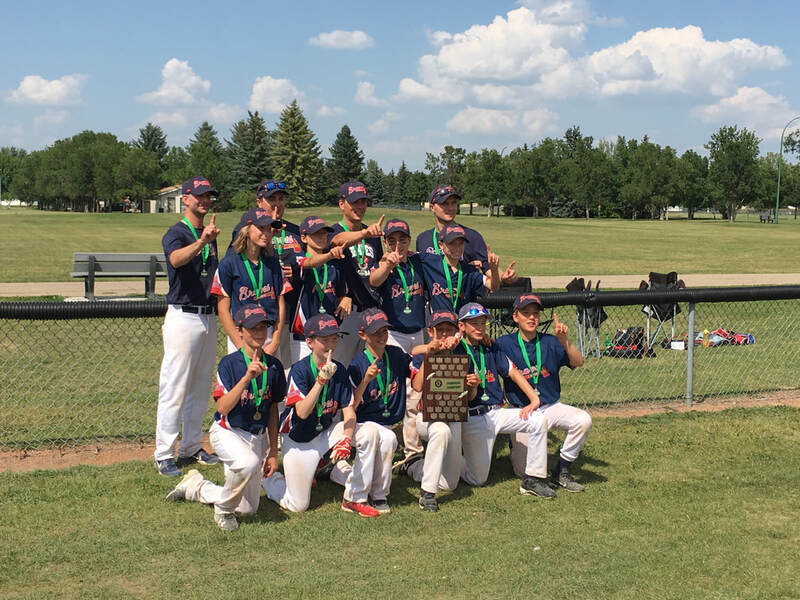 Baseball Sask will be hosting the 2018 Bantam Selects ID Weekend from June 9-10 . The format for the weekend will be for the players to be evaluated on Saturday, June 9th and then put into teams and play games on Sunday, June 10th. The final 30 ID Camp will then be held on July 15 in Moose Jaw. Only players invited to this selection camp can attend. We will use this to help evaluate players to be selected to the 15U Bantam Selects Team that we will be sending to the 2018 15U Baseball Canada National Championship in Oshawa, ON from August 23-26. 2/15/2018 - Online Store Now Open! 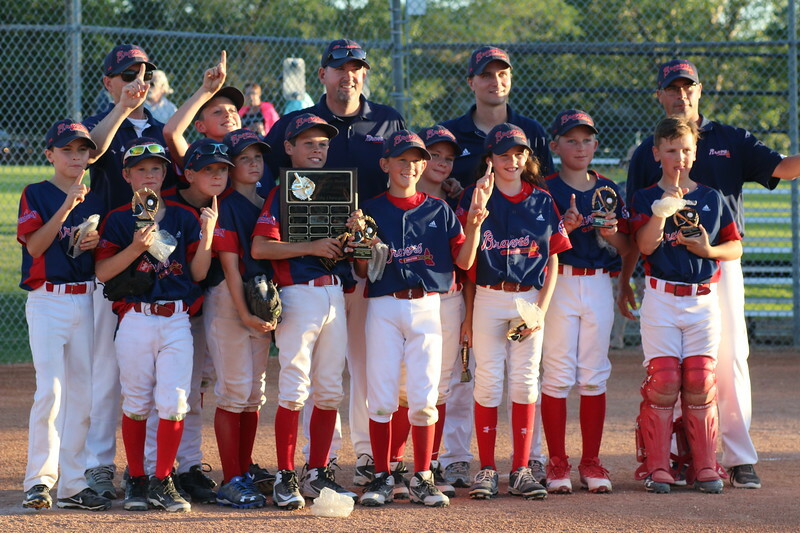 https://nccp.baseball.ca/ or NCCP Requirements for Provincials. The Braves Zone will reimburse the registration fees for Braves coaches who take NCCP coaching clinics. For more information about coaching requirements, please contact Mike at boles62@gmail.com. 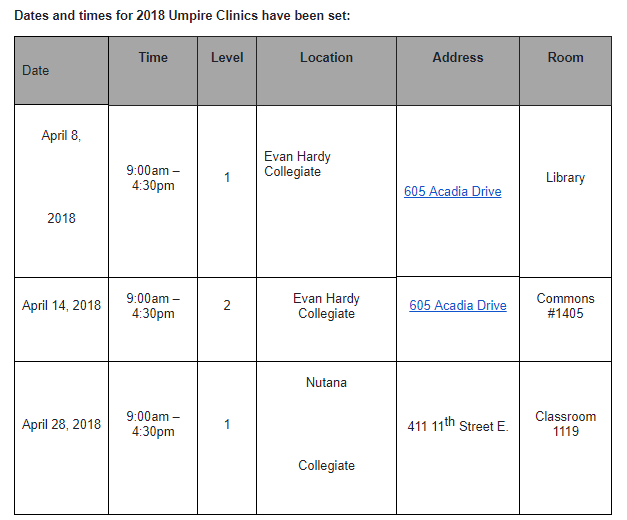 Below is the information for upcoming umpiring clinics in Saskatoon. Please note that Saskatoon Baseball Council Inc. will be covering the fees for anyone interested in taking the course this year. 1/29/2018 - Registration is OPEN! 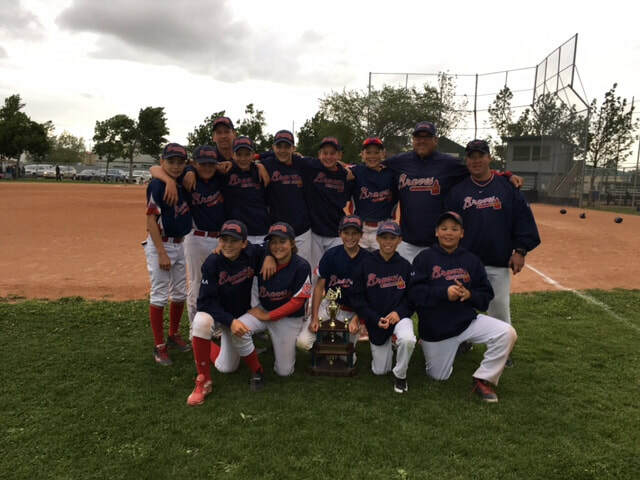 Congrats to the Peewee AAA Braves who won the city championship last night. 07/21/2017 - Congratulations to our city finalists! 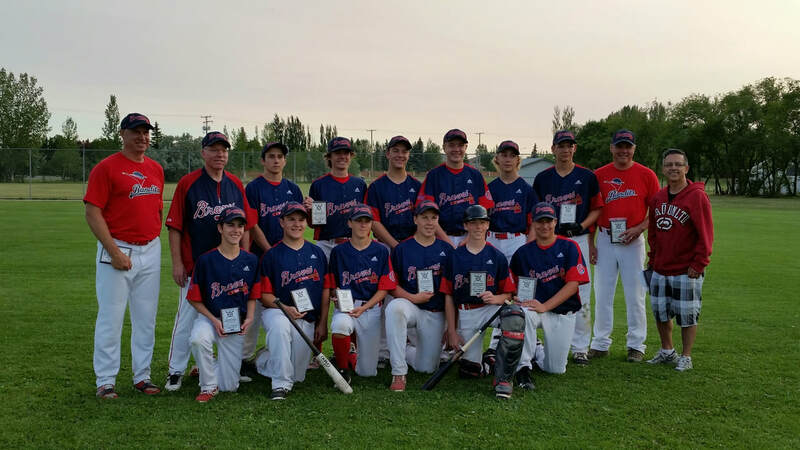 Congratulations to the Bandit Braves (pictured) and the Thunder Braves who made the city final in their respective Midget AA divisions. 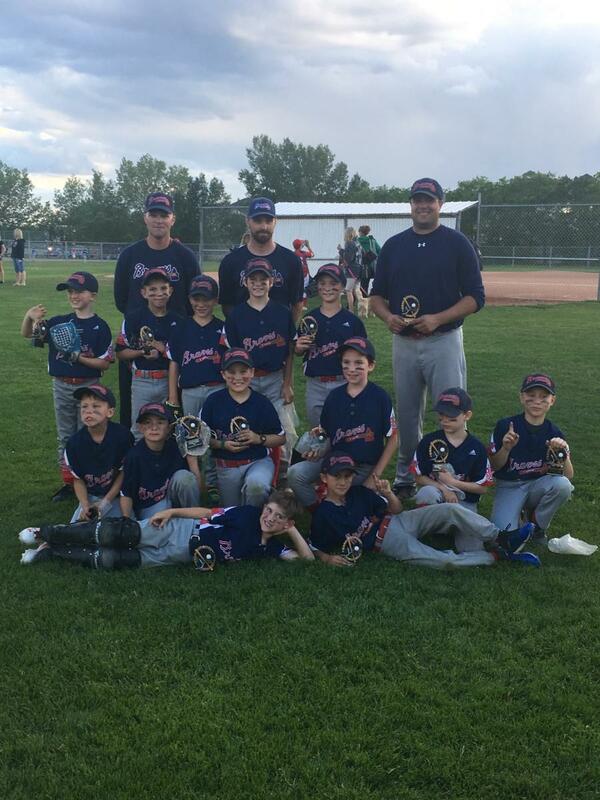 07/07/2017 - Mosquito AAA Champions! The Evaluation Process is posted under the Documents tab. Players will only be required to be at Going Yard for approximately 15-30 minutes on tryouts days. Specific times for each player will be sent out at the end of the next week. For any Braves player interested in attending, the cost of the clinic will be covered by the Braves zone. - After April 1, Rally Cap players will need to contact the coordinators to confirm spot availability. Please email rallycap@saskatoonbraves.com. - Please register online before attending the in person registration nights. - Rally Cap – The coordinators will be collecting more information from parents. Please bring your player as there will be shirt samples to try on – uniforms will be distributed at Spring Training in late April – date TBA. * Mosquito, Pee Wee, Bantam and Midget - Jerseys and caps will be distributed so please bring your player with you for sizing. The 2016 AGM for the Saskatoon Braves Baseball Association will be held on Monday, November 7, 2016 at 6:30pm. The AGM will take place at the Cliff Wright Auditorium which is located right next to the Cliff Wright Library in the Lakewood Civic Center. Please make plans to be there. ​Please consider putting your name in for one of the positions listed above or any other position you may be interested in. It's too soon to put the glove down and hang up the cleats. Going Yard Training Centre is pleased to present Fall Ball and Winter Ball Training Programs. 4/20/2016 - Rally Cap schedules released! ﻿2/4/2016 - Registration for the 2016 is now available! 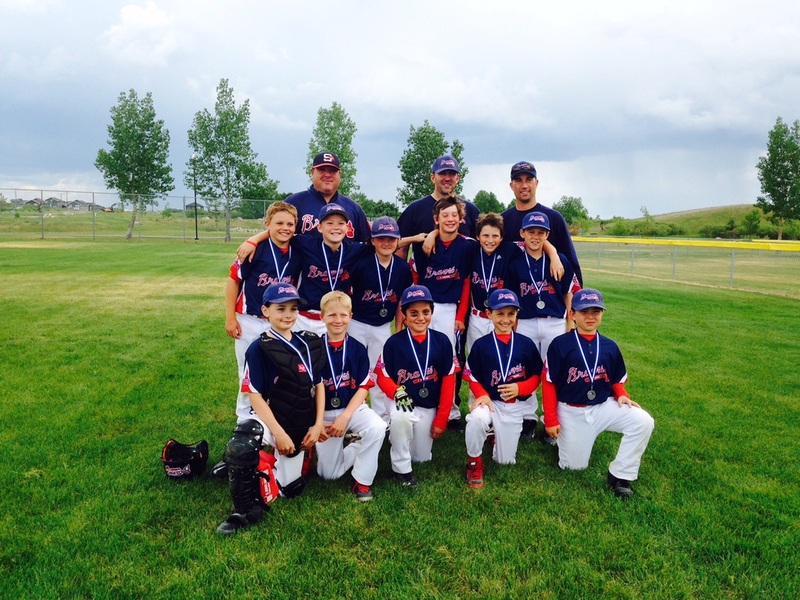 Congratulations to the Mosquito AAA Braves who finished second in the Martensville tournament! 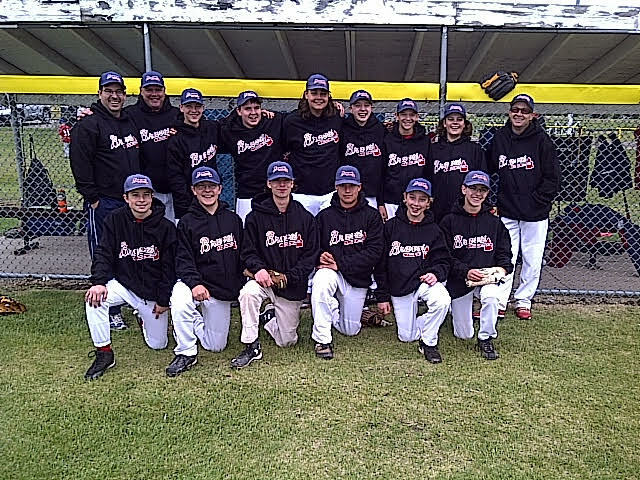 Congratulations to the Bantam AA Braves that participated in the Prince Albert tournament! The Braves AGM will be held on Tuesday, October 21, 2014 @ 8pm @ The Briarwood Rec Center.